This beautiful 1950s inspired dress is made of sumptuous heavy weight satin and features pretty capped sleeves and a satin belt with a delicate pearl bow. The integral petticoat gives a gorgeous fullness to the box pleated skirt. 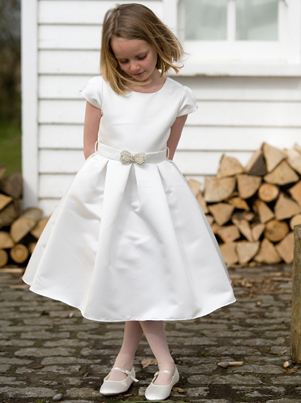 This dress is available in white or ivory satin.